1/2 inch BSP chrome plated cap / blank nut. Great for blanking off unused shower hose outlet connections on bath mixer taps or shower valves. Chrome plated 15mm compression elbow fitting. 15mm chrome plated brass Ballofix type isolation valve. Quarter turn off/on operation (use screwdriver). Chrome plated 22mm compression elbow fitting. 1/2 inch BSP chrome plated brass MxF (male x female) thread extender. Useful to extend tap tails or toilet cistern float / fill valves. 1/2 inch BSP chrome plated air vent valve. Operate with standard radiator vent / bleed key (available in our store). Popular item for towel rail radiators. 1/2 inch BSP chrome plated brass plug. Chrome (plastic with chrome plating) 10mm pipe floor plate. Smaller than usual (15mm is more common). These pipe covers can be installed in seconds without need to drain down or disconnect. 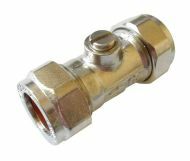 Chrome plated 15mm compression coupler / connector fitting. 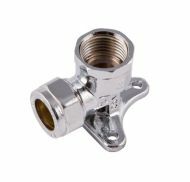 Chrome plated 15mm compression equal tee fitting. 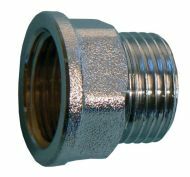 Chrome plated 15mm compression x 1/2 inch female BSP adaptor fitting. Chrome plated 15mm compression x 1/2 inch female BSP elbow fitting. 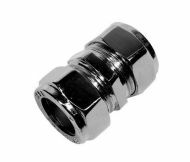 Chrome plated 15mm compression x 1/2 inch male BSP adaptor fitting. 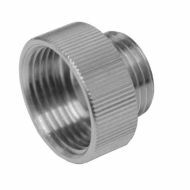 Chrome plated 15mm compression x 1/2 inch male BSP elbow fitting. 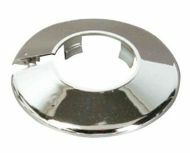 Chrome (plastic with chrome plating) 15mm pipe floor plate. Great for tidying radiator pipes. These pipe covers can be installed in seconds without need to drain down or disconnect. Suitable for standard 15mm pipe and old 1/2 inch copper pipe. Pack of 10 chrome plated plastic 15mm pipe radsnap sleeves / covers, 200mm long. 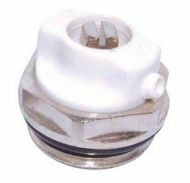 These sleeves can be installed in seconds without need to drain down or disconnect pipework. Chrome plated 22mm compression coupler / connector fitting. 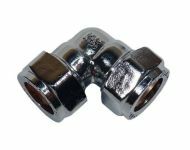 Chrome plated 22mm compression equal tee fitting. Chrome (plastic with chrome plating) 22mm pipe floor plate. These pipe covers can be installed in seconds without need to drain down or disconnect. Suitable for standard 22mm pipe and old 3/4 inch copper pipe. 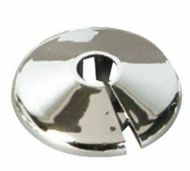 Chrome (plastic with chrome plating) 28mm pipe floor plate. These pipe covers can be installed in seconds without need to drain down or disconnect. Suitable for standard 28mm pipe and old 1 inch copper pipe. Chrome plated reducing hex bush 3/4 x 1/2 inch BSP. Chrome shower hose adaptor / eichelberg reducer. Male 1/2 inch BSP thread (the most common size for a shower hose) and female 3/4 inch BSP thread.